Dibia DREAM partnered with Hyatt B.L.A.C.K. of Hyatt Regency New Orleans launch Carrying Dreams Home Initiative. Think back to when you were in elementary and middle school was your last meal for the week Friday’s lunch at 11:00 a.m.? At least 1 in 6 kids go home on weekends carrying this static on their back the United States. That’s 13 million children according to NoKidHungry.org’s 2016 Fact Sheet. Dibia DREAM partnered with Hyatt B.L.A.C.K. of Hyatt Regency New Orleans in April of 2017 to launch Carrying Dreams Home serving kids attending our DREAM Academy at Kipp Central City Academy. Children in the program were provided with a reusable “DREAMPak” at the end of each week to take home. “DREAMPaks” included non-perishable foods and healthy snacks to help the kids and their families get through the weekend with nourishment. “Our goal is to provide resources that help bridge and eliminate health disparities as well as accelerate health equity in New Orleans. 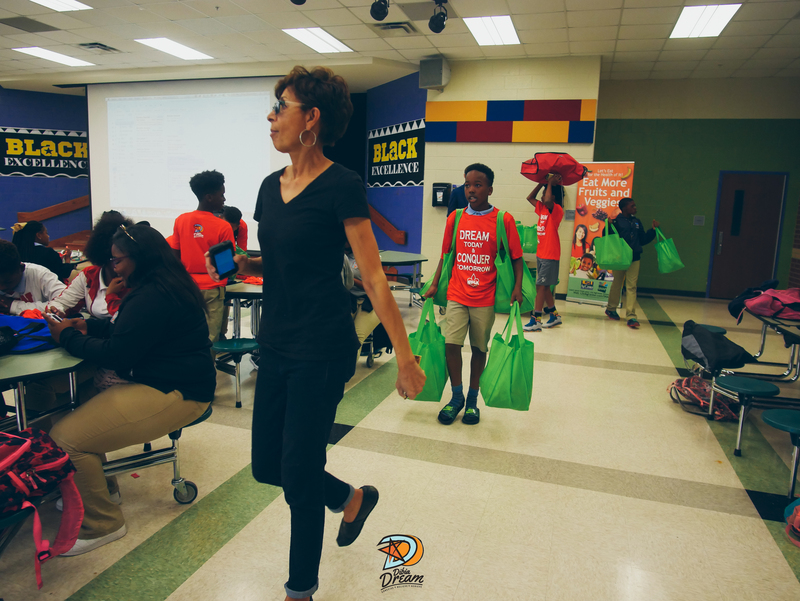 When our kids come to school hungry, they are unable to focus, and incapable of putting forth maximum effort in the classroom,” said Dibia DREAM Founder Brandon Okpalobi. As a New Orleans native Okpalodi saw many of his classmates have this struggle in school. “Carrying Dreams Home is one way we hope to help improve these conditions for them, while alleviating the hunger gap we are seeing in many of these children. Our kids need and deserve proper nourishment– not only during the school day or while attending an afterschool program, but also on those days they are not attending school. Through this program, we aim to provide just that,” he said. 100 percent of the students participating in the DREAM Academy at Kipp Central City Academy are eligible for the National School Lunch Program. The afterschool program was relaunched this year also. From 3-6 p.m. more than 50 students are guided through the afterschool program that concentrates on a holistic and hands on developmental curriculum that covers academics, athletics and life skills. Building on DREAM’s five learning pillars – education, financial literacy, health and wellness, mentorship and sports – the program is designed to push critical thinking skills, while reinforcing the program’s core principals. Our goal is to expand this initiative in the other communities we have programming. As an organization Dibia DREAM is looking to serve 1,000 kids a day in the DRAM Academy. By supporting our DREAMs you can help expand this program.